This set of Concrete Technology Questions and Answers for Aptitude test focuses on “Workability of Fresh Concrete”. 1. What do you mean by workability? Explanation: The workability is defined as the ease with which a freshly mixed concrete can be properly compacted and also that it can be transported, placed, and finished. Explanation: Inorganic retardants include oxides of lead, zinc, phosphate and magnesium salts. Most retarders also act as water reducers. Explanation: Workability of concrete can be improved by more cement and water with proper water cement ratio. Explanation: Workability should be obtained by the use of a well-graded aggregate which has the largest maximum particle size possible. Explanation: Grading of aggregate: Poor grading reduces the consistency. That’s why it is directly proportional to grading of the aggregates. Explanation: Workability of concrete is inversely proportional to Water cement ratio because if the amount of w/c ratio increases, workability decreases. Explanation: At the less workable end of this group, manually compacted flat slabs using crushed aggregates. Normal reinforced concrete manually compacted and heavily reinforced sections with vibration. Explanation: Roads vibrated by hand-operated machines. At the more workable end of this group, concrete may be manually compacted in roads using aggregate of rounded or irregular shape. Explanation: Adding of water increases workability because it is inversely proportional to the workability. 10. Why Shape and texture of aggregates is must? Explanation: The use of smooth and rounded, rather than irregularly shaped aggregate also increase workability. 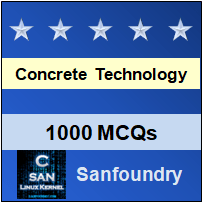 To practice all areas of Concrete Technology for Aptitude test, here is complete set of 1000+ Multiple Choice Questions and Answers.